A metal sphere with excess electrons is brought near a neutral object. Upon contact, electrons from sphere flow to neutral object and spread uniformly. Sphere has now has less excess electrons and the object now has negative charges. Note that the charge in the conductor is always ﻿same﻿ as the charging source. Watch the video below (start from 2:34) to have a clear idea about this process. Induction is a method used to charge a conductor ﻿without any contact﻿ with the charging body. Step 1: Bring a positively charged rod near the metal conductor on an insulating stand. Electrons in the metal will be attracted to the side near to the rod as unlike charges attract. 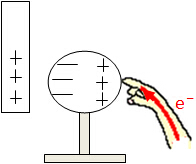 Step 2: Without removing the rod, earth the positively charged side of conductor by ﻿touching it with your hand﻿. Free electrons moving up will neutralize the positive charges on this side. Step 3: With the rod still in place, remove hand from conductor to ﻿stop earthing process﻿. Step 4: Remove the charged rod. The electrons will be ﻿redistributed ﻿and conductor is now negatively charged. Watch the video below to have a visual idea about this process. Bear in mind that the charging source is a negatively charged rod in this video. 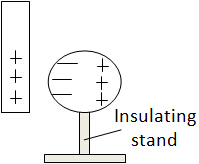 An insulating stand is needed to prevent electrons from flowing to earth or electrons flowing from earth to metal conductor during charging process. We have to remove the hand first then charged rod. If do it reversely (remove rod then hand), electrons will flow to earth. Discharging occurs and conductor is not charged. Number of charges induced in conductor should be ﻿less or equal﻿ to the number of charges in the charging source (rod). 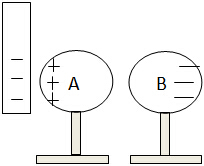 The charge induced in the conductor is always opposite to the charging source. ﻿Step 2: Bring a negatively charged rod near A. Electrons in both A and B will be repelled to the far end of B. A has excess positive charges while B has excess electrons. Step 3: Without removing the rod, ﻿separate ﻿A and B. Step 4: Remove the rod. Note that we have to separate them first before removing the rod. If no, they will neutralize themselves and become neutral.